In the recent remake of the classic movie, The Jungle Book, animals can talk and they understand each other. The jungle animals have this belief that among them, there is one group that is considered divine and the makers of Earth and these are the elephants. Elephants are no less than majestic in real life. Its mere size and dominance clearly shows that nature designed these animals to be one, if not “the” one, of the rulers of the land. 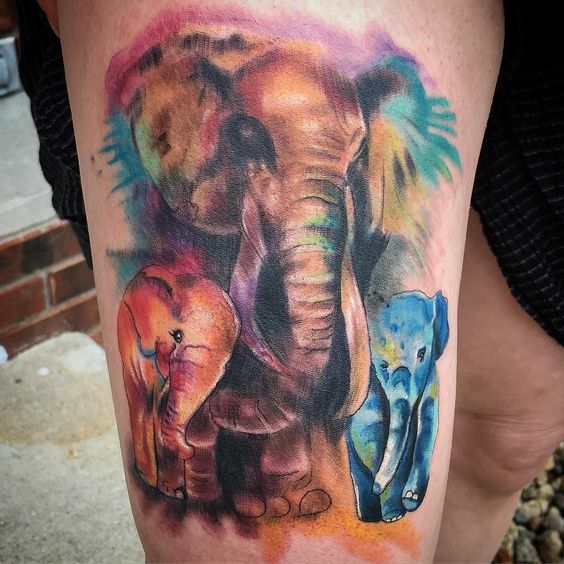 These are some of the reasons why we chose elephants for today’s tattoo post, particularly on one of the best media technique, water-coloring. The combination of the unique physique of elephants and the playfulness of the watercolor technique produce some of the best tats out there. Rendered in all sizes and placed in different body parts, watercolor elephant tattoos do not disappoint. Check out the best of the best tattoo samples we have for you guys today.